Amid criticism by Bangladesh's opposition leader Khaleda Zia of the latest deals signed with India, Prime Minister Sheikh Hasina has said she hid nothing during the visit, unlike Khaleda did when she held the top post.The Bangladesh Nationalist Party chairperson told a press conference on Wednesday that the Prime Minister brought "nothing from India, but assurances".Khaleda also claimed the people saw the visit as the Bangladesh government's failure to secure its interests from its stronger neighbour, reported bdnews24.com on Thursday.She was also sceptical about defence deals with New Delhi, saying the Awami League government was advised against these agreements by many political groups and civil society members.Responding to Khaleda's criticism, Hasina said: "The BNP leader said we kept the people in the dark while signing the memoranda of understanding (MoUs). I have only one question to ask her: Whom did she consult when she signed the defence deal with China? No-one saw what was in it. ""At least, I didn't hide anything like she did," she added at a meeting of the Awami League's Working Committee at the Ganabhaban. Hasina said the deals were placed for clearance by the cabinet before the signing, according to the report. Foreign Minister Abul Hassan Mahmud Ali spoke about the deals at a press conference before the visit and these were also disclosed in the Bangladesh-India joint statement, said Hasina. "Now if someone can't see even after having eyes, then I have nothing to do," Hasina retorted, in a dig at her arch political rival.Hasina claimed Bangladesh has gained by signing the agreements and MoUs with India. "We will be able to bring power from India, diesel will come through pipeline, LNG will alao be brought to overcome the gas crisis," the Prime Minister said, adding that India extended a credit line of $4.5 billion.About Khaleda's criticism of the failure to have India sign the Teesta river water-sharing deal, Hasina asked, "Khaleda Zia was also in power, then why couldn't she bring Teesta water? 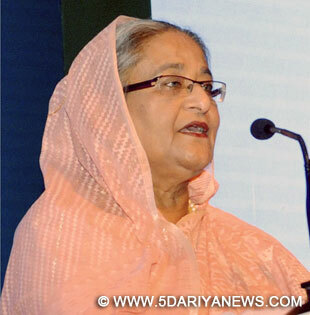 "Hasina said 11 deals and 24 MoUs were signed between the neighbours during her visit to New Delhi last week.